John, the “Ex-Disney Guy”, is a highly sought after internationally known speaker, leading authority in the service industry, business consultant and author of the top selling book, “Making the Customer Experience Magical Now!-How to Succeed in Business and Beat Out Your Competition Today”. Recently featured in the Virgin Atlantic In-flight Magazine, the NBC Morning Show, FOX News, Univision, numerous business journals and Radio, John has inspired audiences with over 3,000 keynotes and seminars to associations, business communities, and a variety of industry professionals throughout the U.S. and all across the globe. Today, John is “America’s Customer Experience Coach” and the "go to" expert presenter and leading authority on tourism, hospitality and service industries alike. 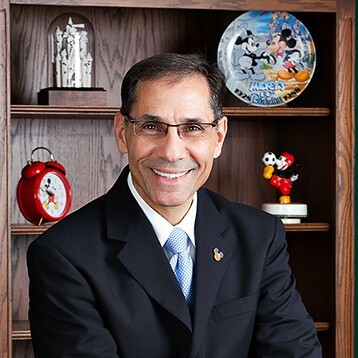 As a former top successful WDW Disney Resort Leader, John will share his incredible experiences, real best practices and proven Disney success strategies, all in an inspiring and entertaining way, to help your audience create a “Magical” Customer Experience and Culture. All Leaders, Staff, Teams and Audiences will be engaged and empowered to achieve extraordinary results. Guaranteed! Find out more about John Formica "Ex-Disney Guy" at http://www.johnformica.com.